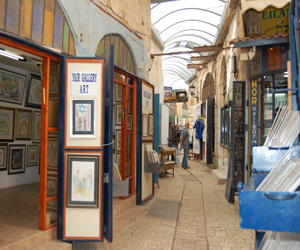 Safed is an ancient city and can trace its history all the way back to the time when the Temple stood in Jerusalem. Since that time, more than 2,000 years ago, the city has been continuously settled and occupied, a fact that has led to the city's rich history and survival. Learn more about the many time periods of Safed and about the many people who contributed to the fascinating history of this city. To learn more about Safed's earliest history, check out our article on Biblical and Roman Era Safed. Find out more about the significance of the city during this time and discover the origins of how Safed became known as a sacred city to the Jewish people. During the years 1099-1291, the Crusaders came to the land of Israel and conquered the city of Safed due to its strategic location atop a mountain. A great citadel was built by the Crusader army on the highest peak of the city to serve as a lookout and as protection for the army. Today the ruins of this citadel can still be viewed and archeologists are working on the restoration of this historic site. Many years after the conquest of the Crusaders, during the 1500s, the Ottoman empire conquered the area and Safed became a city under direct Ottoman rule. Check out our article on Ottoman Safed and learn more about the city of Safed during these periods of foreign rule. To best understand Safed's connection with Kabbalah and where it got its title ‘the city of Kabbalah,' it is best to check out our articles on the City of Kabbalah and Safed in the 16th century. Also learn more about the many Rabbis who contributed to the rich religious history of the Safed, creating its image as a mystical city, by reading our articles on Rabbi Karo, Rabbi Cordovero, Rabbi Vitel, Rabbi Beirav, and Rabbi Luria, as well as our article on the historical synagogues of Safed. Safed sits near the great African-Syrian Rift, a very large fault line that runs from Turkey in the north, to Africa in the south. Due to its location along this line, Safed has experienced many devastating earthquakes over the years. Check out our articles on earthquakes in Safed and learn how these earthquakes have shaped the look, mentality and legends of the city.